I have been running CQRLOG connected to a YAESU FT-450D without any troubles, I can control the radio from CQRLOG, open FLDIGI and WSJT. I upgraded my station and now have a YAESU FT-991A. I want to connect to the radio using only the USB port. When I tried to connect, I do not see the radio on the TRX control RIG list. I am running CQRLOG V2.2.0 (001) dated 2017-12-30 and Hamlib 1.2.15.3. I understand there is a newer version of hamlib that includes the FT-991 on the list my guess is that I need to upgrade hamlib and then I'll be able to use the new radio under CQRLOG. Any ideas on how to upgrade it? as console command. For me it gives: libhamlib2 is already the newest version (3.1-7). I think for you it installs newer version. I'll try to perform the update tonight. Let you know the results. libhamlib2 is already the newest version (1.2.15.3-3.1build1). libhamlib2 set to manually installed. 0 upgraded, 0 newly installed, 0 to remove and 27 not upgraded. It looks like you have version 3.1 installed. Version number is at first line. If you have 3.1 it is the latest official. If you have installed WSJT-X 1.8.0 it installs the latest (stabile) version, but it is named as rigctld-wsjtx. If you get text like that then you can change cqrlog prferences/trx control/path to rigctld to point this file. Just add -wsjtx at the end of existing text. Then try does it work. Both seems to know FT-991 (-m 135) is'nt that working? You are right, the 991A is connected and sending frequency information to CQRLOG Now. I need to keep reading to tweak the communication parameters, the frequency on the QSO Windows does not update as fast as before (comparing with a serial connection to FT-450D). I guess it updates faster than you can keep full qso :) ! I have poll value 1000 (ms = 1sec) in my settings with serial speed of 19600 to IC706. That is fast enough. I have run also with 2500 (2,5sec) and it is good enough, too. My qsos usually lasts longer than 2,5sec so the right frequency is there at the time of pressing "Save qso". 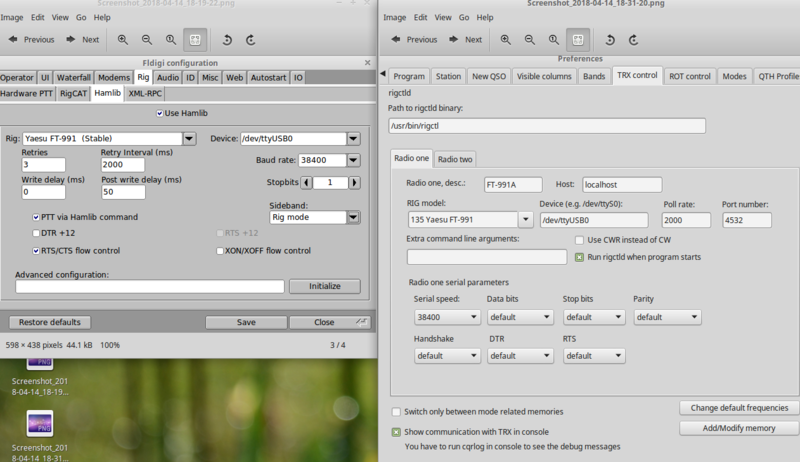 Also The program FLDigi is working with the parameters set as in the picture attached (top left). and so on.... but no numbers in the frequency. I have also tried another log-software (xlog) and is working. it looks like vfo is not working. Could it be the reason it is not working? but it works as long as frequency and mode are ok. I have written about this subject here for some times. You find them using search. So In cqrlog you should use same parameters. TRXcontrol/radio one parameters: 38400 , default, default, default, default, default, default should give you that. So many times that you get "no processes". Then start cqrlog again. Then you are sure TRXcontrol settings are ok. When you are working with cqrlog AND fldigi OR wsjtx, OR any other program that uses rig CAT. You should NOT set up your yeasu with similar parameters in those program's setups!! Instead all other programs should use "net rigctld" as rig and localhost:4532 as the port. I that way you do not have conflicts with CAT serial port as only ONE rigctld is accessing your rig via serial interface and it is sharing the information to all programs. All programs can the run at the same time ! You can even telnet localhost 4532 and control your rig there while programs are running. I used (in terminal ) rigctld with same parameters and it does not work. D stands for daemon. Rigctl is a foreground program and is not right for cqrlog. Cqrlog debug messages say rigctld as hard coded, but if your setup string is wrong (=rigctl) it will not work. Check the path/filename in preferences/TRXControl. See what I have my picture from this morning from previous message. FINE !! it works !! The difference of d and without d is so small that I messed it at first message. I should have noticed it already then. But as my picture is from working setup it was ok if checked from that. It is very important that other programs do not start another rigctld program(s) as they may work a while, but sooner or later they have problems. Only way is to run one rigctld either started by cqrlog, or started as system service at operating system startup (when cqrlog also need rig model 2 "Net rigctld" and uncheck "start rigctld at program start"). Linuxes are usually not so critical as windozes that say immediately that you are going to access already used serial device. They may let several instances access to same serial device and it is users role to check that it does not cause conflicts.